Two sets of the RCF VSA Series have been installed on the pillars, which essentially sit between the older Chancel area and the newer Nave area, firing outwards towards the Nave. The top arrays are VSA 1250’s and due to their position are able to disperse the sound all the way to the gallery. The lower columns are the VSA 2050’s, which cover the main Nave seating. RCF CS Series loudspeakers are used for infill of the first 10-metres of seating in the Nave, as well as throughout the Chancel. For the evensong services its got a pre-programmed preset, which loads up at a specific time everyday and turns the system off again. Linking up the appropriate RF mics, and it all looks after itself. In addition, an iPad interface that communicates directly with the MTX processor, so the in-house engineer can tweak the functionality of the system, without needing to have the desk on. Then, for the Sunday services and larger events, someone will be operating the console. In addition, the main columns are self-powered but the fill loudspeakers aren’t, so using Yamaha XMV Series amplifiers was needed, also a number of Sennheiser EW 500 G3 wireless systems and some DPA gooseneck and lapel mics. The cathedral saw some Chauvet LED wash moving heads, including eight QWash 4192’s, eight Ovation F-165WW fresnels and four Ovation F-95WW fresnels installed. 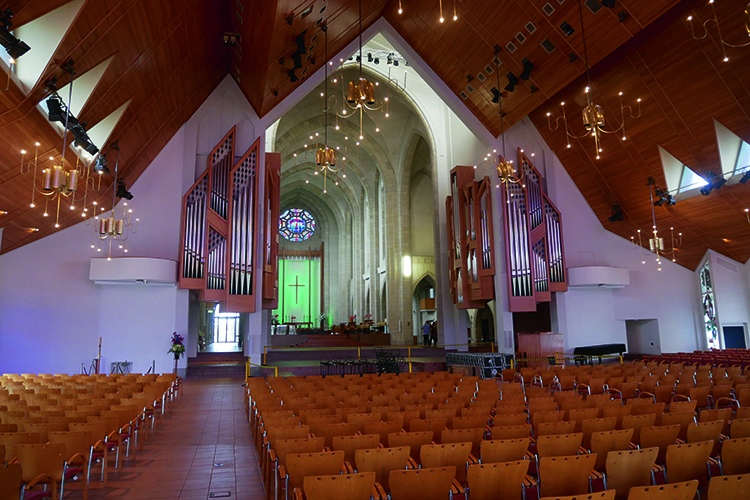 These sat alongside some Cameo fixtures – four Flatpro 7’s and eight Flatpro Spots – to replace the lighting bars, while the original dimmers and conventional fittings were already in place from when the Nave first opened. The cathedral wanted a light music reinforcement system but their main requirement was speech clarity. Despite the bridge being removed as part of the new design, the main challenge was to achieve full and even coverage for the entire Nave, without interfering with stunning architecture in the older part of the cathedral. 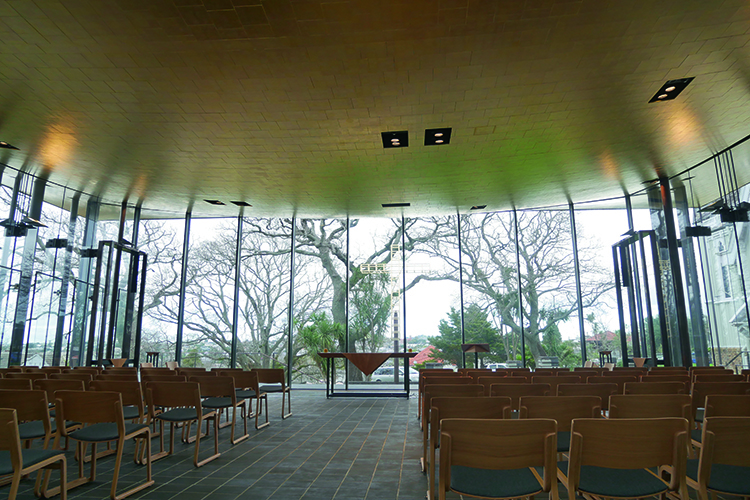 The Bishop Selwyn Chapel – or the gold room, as it is sometimes referred to, due to its gold ceiling – makes use of the RCF VSA Series, with more VSA 850’s being installed, coloured coded to the surroundings. 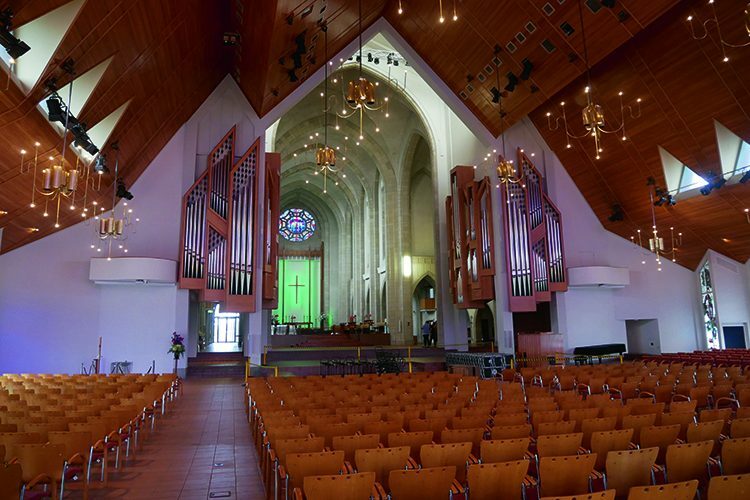 The work in the Bishop Selwyn Chapel followed on directly from the work in the main church, so when we specified a very similar system using more VSA loudspeakers, another MTX processor, as well as the same Sennheiser EW 500 G3 wireless systems.